I like Nithyananda and Sadhu Sundar Selvaraj of Angel TV for various reasons. 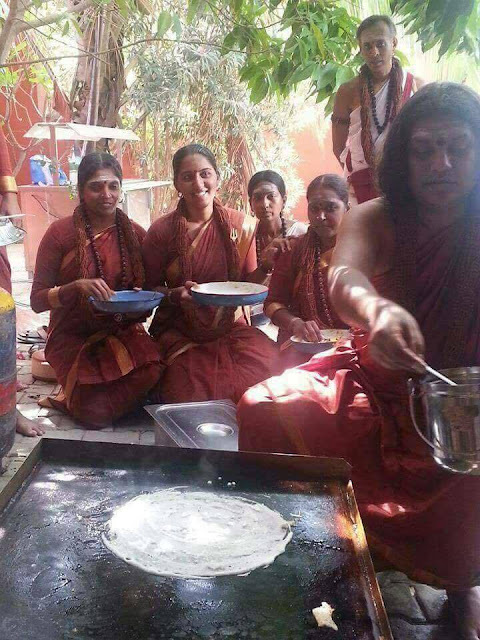 I like Nithyananda because even after getting asingappattufied many times, he still maintains that milk flowing face that is adorned by a baby smile. He still preaches so called philosophies and he still has fans who believe that the Ranjitha CD was doctored. I like Sadhu Sundar Selvaraj because of his frock and also because he travels to heaven and hell frequently and comes back to earth to tell us stories. There are people who still believe that he is a prophet. This is when I thought that if I wear one of those kaavi frocks and tell some nonsensical crap and call that philosophy, I might be treated as a philosophical guru too. So this morning, when I was in the loo, I thought hard amidst all the constipation to come up with a one liner. I ended up getting all sorts of poop jokes in my head. Now all I have to do is, wear a kaavi frock, put on a plastic smile in front of the camera and utter the above quote in Rani Mukherjee's tone. When I do that I am pretty sure that I will be called as a Philosopher and I might be even addressed as Sadhu Chronicwriter. Becoming a Sadhu also means that you need not have to worry about all that happens around you. Be it the Bangalore molestation or demonetization or Dhoni stepping down from captaincy or Sasikala becoming the CM candidate; you would not be perturbed if you are a Sadhu. You will just chill and cook Dosa for your fans. Will some one buy me that frock?